You are currently browsing the archives for the tag 'bamboo handles'. The famous Gucci bamboo collection has been an icon for decades, first introduced by the brand’s artisans in the ’40s. I still remember how impressed I have been when I visited the Gucci manufacture last year and actually experienced the amazing craftsmanship and work process behind such a bag and its bamboo handles that have become synonymous for the Italian fashion house. This striking model in the pictures is called Lady Lock and is the newest addition for F/W 2013. Its contemporary silhouette works perfect for everday use. 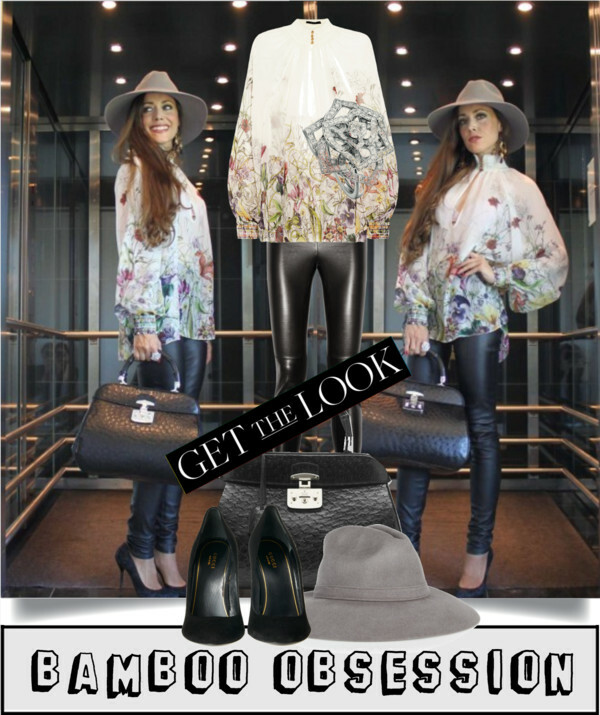 My look: Floral-print smocked silk-chiffon top, stretch-leather skinny pants, grey hat, suede pumps, earrings and Lady Lock ostrich leather top handle bamboo bag, all by Gucci. Rose ring by Piaget.